Sitting at a table with her parents, Sherri and Alan Breslow, 24-year-old Cherry Hill native Sydney Breslow smiles as she talks excitedly about her future. Sydney is in her final semester of graduate school at High Point University in North Carolina. She is planning to work as a special education teacher in the Raleigh area and recently found an apartment, which she plans to move into early in 2017. A couple decades ago, Sherri and Alan weren’t sure Sydney would ever get to this point in her life. At the age of 8, Sydney was diagnosed with mitochondrial disease, which severely impacts Sydney’s fine and gross motor skills, making everyday tasks a challenge. However, Sydney hasn’t allowed her condition to hold her back. Her determination and work ethic allowed her to earn a bachelor’s degree in 2015. She majored in special education so she could help kids who are facing challenges similar to what she faced. She also is passionate about volunteering, spending lots of her free time raising awareness about mitochondrial diseases and raising money for the United Mitochondrial Disease Foundation. On Nov. 17, Sydney and her family are bringing mitochondrial disease awareness to South Jersey. They are holding a community fundraiser called Cousins for a Cure 2016 at the Mansion in Voorhees. The fundraiser will benefit a research fund the Breslow family created three years ago, with all proceeds going to the United Mitochondrial Disease Foundation. Sherri and Alan knew something was not right with Sydney from the time she was an infant. Other than sitting up, Sydney missed all of the major milestones a child usually reaches during development. The Breslows did their best to find an answer with multiple doctors. It wasn’t until Sydney turned 8 when she was finally diagnosed with mitochondrial disease. Mitochondria are compartments in a person’s cell that produce more than 90 percent of the body’s energy. With mitochondrial disease, a person’s mitochondria fail to produce energy. This can cause a wide-range of various issues with different systems in the body. Sydney’s disease mainly affects her neurological system and causes her to struggle with her fine motor skills. While Sydney’s disease can be difficult, there are others whose disease can prevent them from essential life functions, such as eating. “Some of these children and adults, they are so, so sick,” Sherri said of others diagnosed with mitochondrial disease. One of the reasons the Breslow family believed it took so long for Sydney to be diagnosed was the lack of knowledge on the disease in the 1990s. Alan said many doctors had limited knowledge of the disease when Sydney was younger. There is no cure for mitochondrial disease, but treatments help alleviate symptoms as well as slow down the disease’s progression. Sydney knows the disease is something she has to live with. However, she is determined to have a happy, successful and independent life. Mitochondrial disease has hampered Sydney’s ability to do a number of things. After suffering a setback about seven years ago following back surgery, Sydney’s speech, balance and ability to walk were partially impaired. Despite this, she has been able to succeed in school and in life. Alan and Sherri helped sow the seeds for Sydney’s success. Alan said placing Sydney in the best possible school setting was important to her academic career. Sydney attended high school at Delaware Valley Friends School in Paoli, Pa., and then later went to college at High Point. “We had to look at places she would survive and thrive in,” Alan said. Sydney’s determination has also been crucial. Sydney struggled in school to complete her classwork as quickly as most of her peers. However, she has still managed to make the grade thanks to an infectious work ethic. Sydney’s new apartment in Raleigh will allow her to live independently. The location provides easy walking access to stores, which is important, as Sydney is unable to drive. Most of the Breslows’ extended family lives in North Carolina, giving Sydney a strong support system. Sydney is also scheduled to receive a service dog next year. The dog will help her with vision as well as balance while walking. Sydney is scheduled to graduate from graduate school in December. 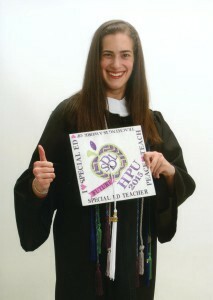 She will earn a master’s degree in special education with a concentration in intellectual disabilities. Sydney is excited about the prospect of getting to work in special education. “It’s something I love to do, teaching and helping other people with their disabilities,” she said. “I think with her career choice now, Sydney is going to be such an inspiration and will be able to help people because they’re going to be able to relate to her,” Sherri added. Sydney and her family’s passion for helping others is the driving force behind their commitment to raise money and awareness for UMDF. Shortly after Sydney’s diagnosis, the Breslows began fundraising for the United Mitochondrial Disease Foundation, an organization dedicated to raising money for research and education for the diagnosis, treatment and cure of mitochondrial disorders. The UMDF also provides support programs to affected patients and their families. Even as a kid, Sydney was committed to raising money and awareness. She would hold fundraisers in school where her peers would donate. To help spread knowledge about mitochondrial disease, she would create a fact of the day for her classmates. “No one really knows about (mitochondrial disease),” Sydney added. The Breslows had been attending UMDF fundraisers for a number of years when a tragedy prompted them to create their own fund. 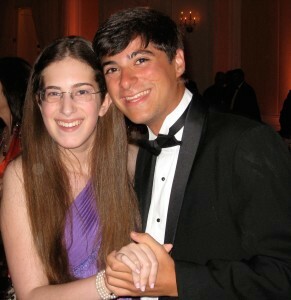 In November 2013, Sydney’s cousin, Logan Aronson, died suddenly in a car accident in North Carolina. Sydney said she was close to her cousin and described him as loving and fun to be around. Logan’s parents, Debra and Ron, asked the Breslows to create a fund in Logan’s memory. 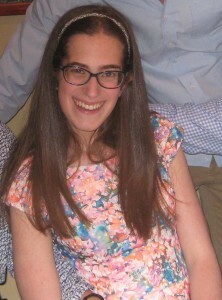 The family created the Logan Sloane Aronson Research Fund for Mitochondrial Disease in honor of Sydney Breslow, with all of the money donated to the fund going directly to UMDF. “It makes my sister and brother-in-law so happy that something good is coming out of this,” Sherri said. As of October, the fund has raised $19,256. Much of the money was donated following Aronson’s accident. The Breslows also raised money for the fund at UMDF walks. The event was successful before the Breslows even sent the invitations. Sherri estimates the event raised $70,000 through donations from businesses, community members and sponsors before the Breslows put tickets on sale. As of Oct. 24, $87,708 has been raised for the event. The family’s goal is to raise $200,000. As important as it is to raise money for UMDF, Alan said raising awareness will be just as important at the event. There will be some basic information on mitochondrial disease, and UMDF plans to debut a new awareness video at the dinner. Even though mitochondrial disease has forced Sydney to live a life different than most other people her age, she said there is a bright side. Sydney feels the challenges she faced has made her into the strong and determined woman she is today. “If I didn’t have mitochondrial disease, I don’t think I’d be the person I am today,” Sydney said. Tickets for Cousins for a Cure 2016 are on sale for $150 each. All proceeds from the event will go directly to the Logan Sloane Aronson Research Fund for Mitochondrial Disease. All donations are tax deductible. To purchase tickets or for more information about the event, visit www.umdf.org/cousinsforacure16.